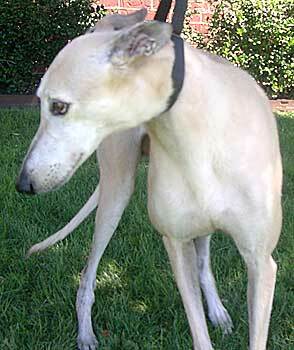 Bobbi, aka Bobbye's Fancye, is a stunning champagne fawn 9½-year-old female, born January 23, 1996. Her sire is the famous Wigwam Wag and her dam is Ms Miss Lillie. Bobbis racing career consists of 154 races, starting at the track in Phoenix, AZ on April 25, 1998 and finishing at the same track on August 21, 1999. From there Bobbi went on to the brood career of her life, producing three litters. 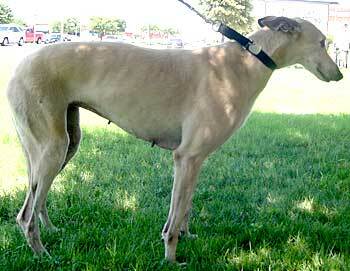 The first was sired by Minaki Zeke and produced 5 greyhound pups in May 2001. August 2003 found her again producing 4 pups with the sire being Cry Havoc. Her last litter was the largest, 9 puppies, sired by Blazing Desire in July 2002. From there she went on to be a blood donor, making her a greyhound that has given, given and given of herself. Isn't it time for something to be given back to her? Dont let her age fool you she will give any 2 year old a run for their money! It is not known at this time if Bobbi is small animal or cat tolerant, but she is living in a foster home with other greyhounds.